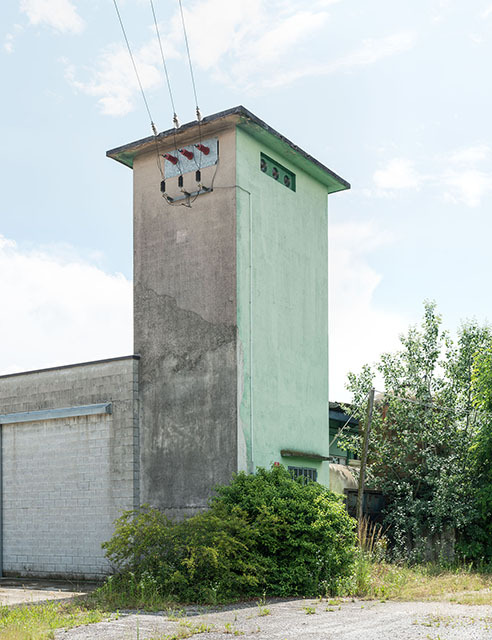 Il punto di partenza del mio lavoro a Castelfranco Veneto sono state le fabbriche, gli edifici industriali,gli hangar, il “Capannone”: spoglio, costruito per uno scopo preciso ma spesso visivamente intensificato dallapittura. Nel mio lavoro li ho riportati all’idea primaria, alla forma e al colore. 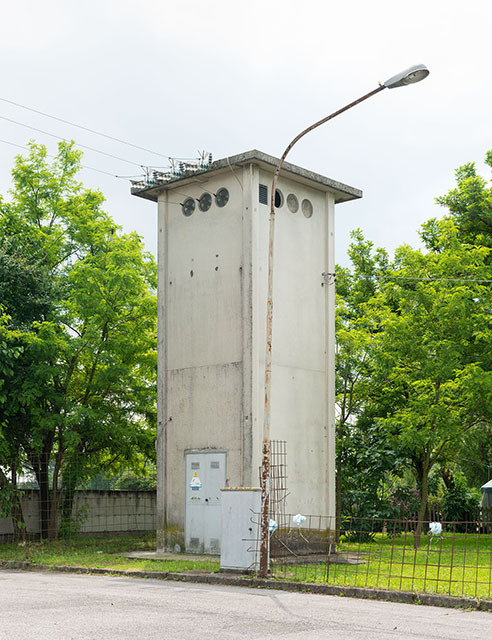 Lo studio dello spazio urbano mi ha condotto ai luoghi che collegano e riforniscono i siti produttivi, le torri anonime della rete elettrica, “Le Torri di Castelfranco”, che si espandono invisibili attraverso l’area e diffondonouna rete di approvvigionamento. 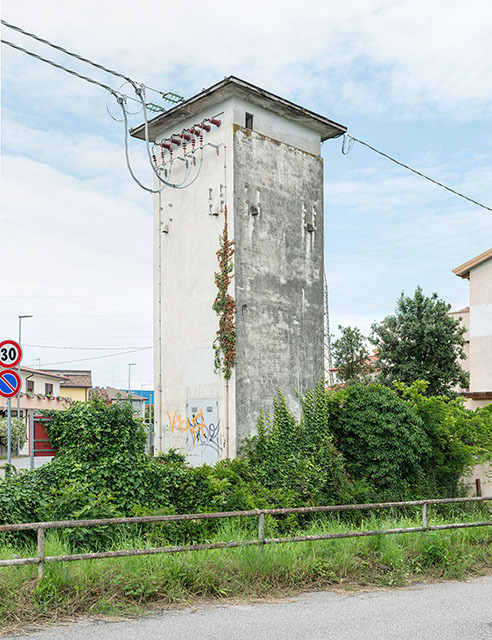 L’idea di una rete di comunicazione è ripresa anche nel video “Roundabouts”, che interessa tre rotatorie localizzate nelle aree suburbane di Castelfranco e ne visualizza i vari flussi, il trafficodelle merci e dei passeggeri. 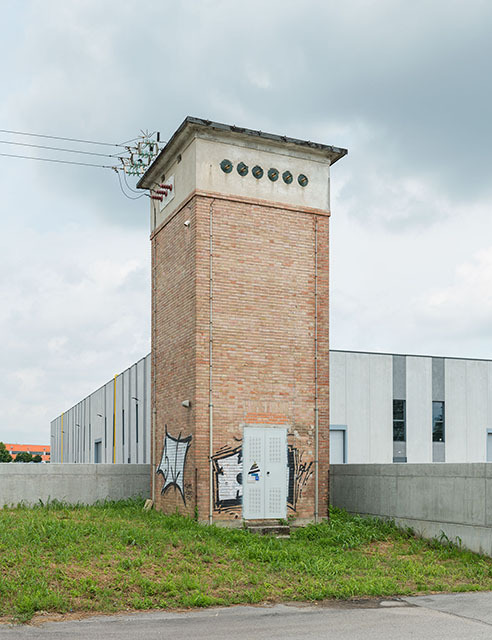 The starting point of my work in Castelfranco were the factories, factory buildings, sheds hangars, “capanonne”, unadorned, build for a specific purpose, but often visually intensified with paint. In my work they are reduced to the basic idea, to form and color. 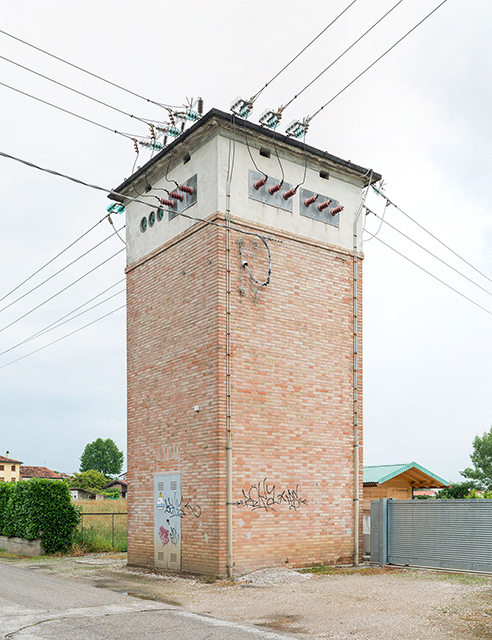 The examination of the urban space led me to the points that connect and supply the production sites, the anonymous towers of the power grid “Le Torri di Castelfranco”, which expands invisibly across the area and span a supply network. 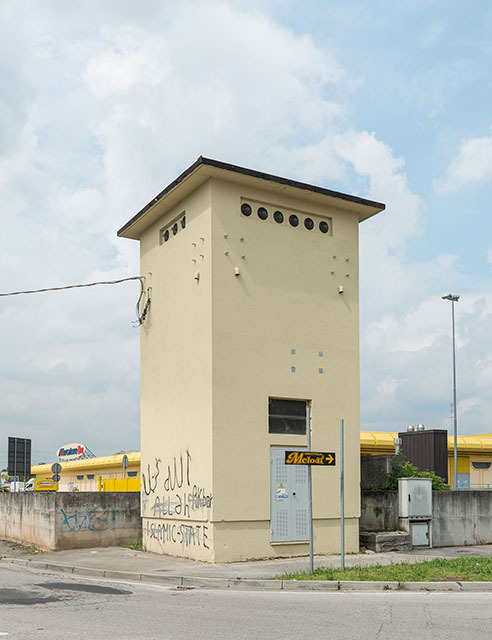 The idea of a network is also taken up in the video work “Roundabouts”, which deals with 3 roundabouts in the suburban areas of Castelfranco and visualize the various streams, delivery and passenger traffic. Josef Schulz è nato nel 1966 a Biskupiec in Polonia, vive e lavora a Düsseldorf in Germania. Ha studiato alla Düsseldorf Academy of Art con il Prof. Bernd Becher e il Prof. Thomas Ruff.Ha esposto in numerose mostre in tutto il mondo e ha fatto parte di importanti festival fotografici, comeil CONTACT Photography Festival a Toronto, il FIF a Belo Horizonte in Brasile e il Pingyao Photo Festival in China. 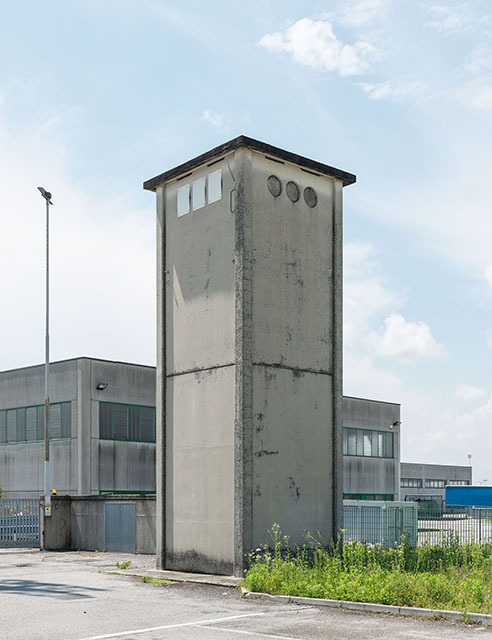 Josef Schulz ha vinto l’European Architectural Photography Prize nel 2001, una borsa di studio dello ZF-Kulturstiftung Friedrichshafen e del Kodak and Large Format Inkjet Award, è stato il vincitore del Festival “Voies Off”ai Rencontres d’Arles in Francia. Il suo lavoro è stato presentato recentemente su numerosi blog e siti web, tra cui PBS, Huffpost.com,De Morgen, Gazeta Wyborcza e Suedeutsche. Il suo lavoro è incluso in prestigiose collezioni come UBS, Deutscher Bundestag, ZKM, Karlsruhe, Deutsche Börse e FNAC Francia. Josef Schulz was born in Biskupiec, Poland, in 1966. He lives and works in Düsseldorf, Germany. He studied with Prof. Bernd Becher and Prof. Thomas Ruff at the DüsseldorfAcademy of Art. He has had numerous exhibitions all over the world, and has participated in major photo festivals, such as the Contact Photography Festival, Toronto; FIF, Belo Horizonte, Brazil; and Pingyao Photo Festival, China. 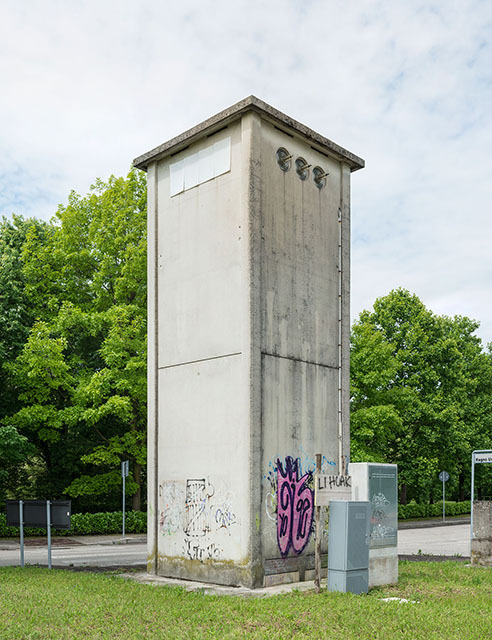 Josef Schulz won the 2001 European Architectural Photography Prize, was awarded a Grant by the ZF-Kulturstiftung Friedrichshafen, won the Kodak and Large Format Inkjet Award and was the Winner of the Festival “Voies Off” de Rencontres d’Arles,in France. Most recently, his work has been featured on numerous blogs and the websites of PBS, Huffpost.com, DeMorgen, Gazeta Wyborcza and Suedeutsche. He is represented in prestigious collections like UBS, Deutscher Bundestag, ZKM, Karlsruhe, Deutsche Börse and FNAC France.